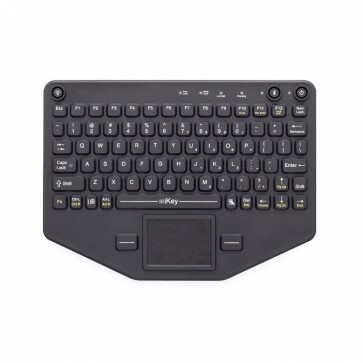 The BT-80-TP is a tough industrial rugged keyboard that offers the most innovative Bluetooth® compatibility available to date—a key feature is that it doesn't require the use of a USB dongle if your computer has an internal Bluetooth® radio. 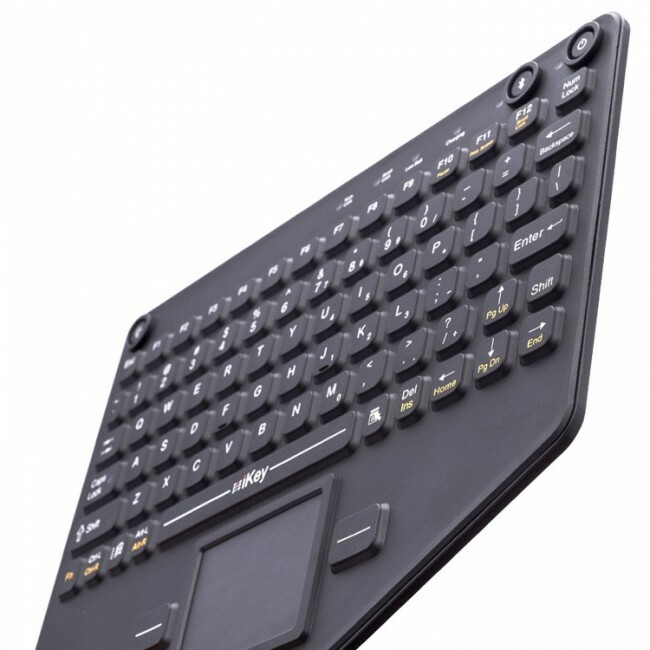 Add to that the compact design and rugged exterior, and you have a keyboard that is highly portable. You need a keyboard that can withstand a hostile environment. It needs to be convenient to use, easy to clean and reliable, with wireless technology and long battery life. Are you expecting too much? No - iKey has created the innovative BT-80-TP to satisfy the most demanding users, combining enhanced functionality with rugged good looks. 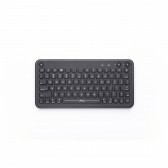 The BT-80-TP is a tough industrial keyboard that offers the most innovative Bluetooth® compatibility available to date—a key feature is that it doesn't require the use of a USB dongle if your computer has an internal Bluetooth® radio. Add to that the compact design and rugged exterior, and you have a keyboard that is highly portable. The BT-80-TP has also been designed to withstand harsh industrial settings. The casing is fully sealed and meets IP68 / NEMA 4X specifications, making it dirt, dust, water, corrosives and ice resistant. The keypads are silicone rubber with tactile, mechanical snap key switches, while the case itself is ABS polycarbonate. Adjustable LED backlighting allows for use in poor light and it has an integrated touchpad. Furthermore, it is also available with a VESA mounting pattern and optional magnetic mounting, making it ideal for vehicular or medical cart applications. Built for testing conditions, the BT-80-TP is the go-to keyboard for users who need rugged flexibility and convenience of use. This makes it ideal for professionals in the military, emergency services, medical settings, the food and drink processing and distribution industries, laboratories and clean rooms, material handling, on industrial and manufacturing sites and in the energy industry. 10.04" x 7.41" x .71"
These are just some of the applications for the iKey BT-80-TP in various industries. The potential applications extend further than those shown above. 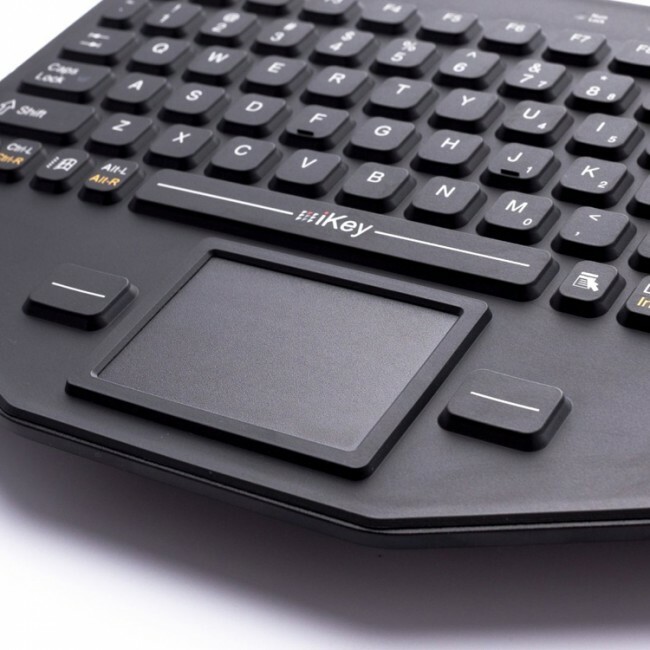 For further information about the iKey BT-80-TP Keyboard or to check if the product is suitable for you application, please contact us. To obtain service under this warranty, the warranty-eligible product, iKey BT-80-TP Keyboard, must be presented to FB Peripherals Limited in the UK.